They are everywhere on the sandy shore at low tide. Don't step on them! They are very shy. To see them, wait quietly without moving. 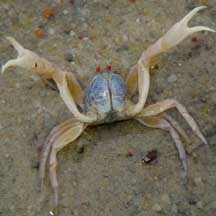 Unlike most crabs, they can run forwards, backwards as well as sideways. Features: Body width to about 1.5cm. Body spherical, greenish eyes on short thick reddish stalks. Pincers very long, slender and folded downward with the claws pointed towards itself. 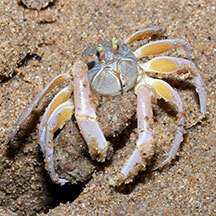 The crab is well adapted for life out of water: it can absorb air through special parts of its legs which are thinner. It also absorbs water from the sand through silky hairs on the abdomen. Unlike most crabs, the soldier crab can run forwards as well as sideways. And it can move very fast indeed! Dotilla wichmani is smaller (body width up to 1cm) and prefers sandier areas not wandering far from its hole. Dotilla myctiroides is larger (body width up to 1.5cm) and is found in muddier areas often moving around in large groups at low tide. This habit of 'trooping' in numbers gave these crabs their common name. Burrowing in a bubble of air: A study found that Dotilla myctiroides in wet semi-fluid sand builds an 'igloo' of sand pellets by rotating itself, in order to seal a bubble of air around itself in the wet sand. 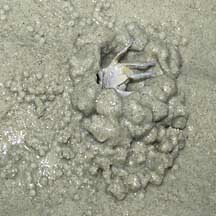 Beneath the sand, the crab continues to scoop sand from below it and plaster the sand above the bubble of air. 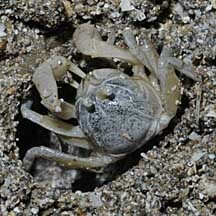 In this way, the crab in its bubble of air is able to burrow downwards. 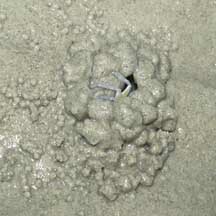 In more stable sand, the crab builds a vertical burrow. Sometimes mistaken for the sand bubbler crab. 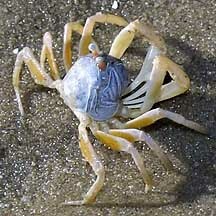 The soldier crab is larger and has longer, more slender pincers. What does it eat? 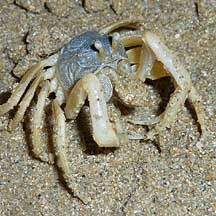 The soldier crab eats the thin coating of detritus on sand grains. Sand grains are scraped up with the downward pointing pincers and brought to the mouthparts that then sift out any tiny food particles. 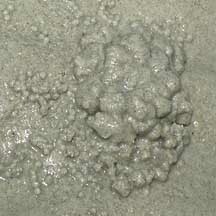 The shifted sand is then discarded in a little ball. 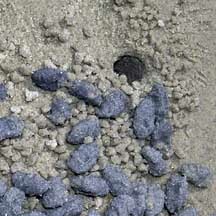 The bigger untidy balls are sand pellets dug out of the burrow. 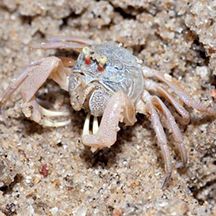 Status and threats: One of our soldier crab species (Dotilla myctiroides) is listed among the threatened animals of Singapore due to loss of our natural beaches. While somewhat common on Chek Jawa, they are not commonly seen elsewhere in Singapore. Like other creatures of the intertidal zone, they are affected by human activities such as reclamation and pollution. Trampling by careless visitors can also have an impact on local populations. Spitting out a sand ball. 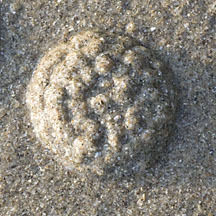 sand balls around the opening. 'Igloo' built just before the incoming tide. Shared by Loh Kok Sheng on flickr. Shared by Loh Kok Sheng on his blog. Photo shared by Heng Pei Yan on facebook. Photo shared by Loh Kok Sheng on his flickr. in red are those listed among the threatened animals of Singapore from Davison, G.W. H. and P. K. L. Ng and Ho Hua Chew, 2008. The Singapore Red Data Book: Threatened plants and animals of Singapore. 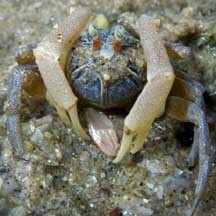 Soldier crab (Dotilla sp.) Tan, Leo W. H. & Ng, Peter K. L., 1988. A Guide to Seashore Life. The Singapore Science Centre, Singapore. 160 pp. 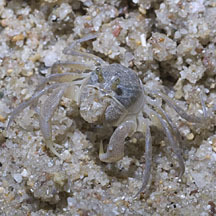 Soldier crab (Dotilla myctiroides) Ng, Peter K. L. & N. Sivasothi, 1999. A Guide to the Mangroves of Singapore II (Animal Diversity). Singapore Science Centre. 168 pp. Dotilla myctiroides and Dotilla wichmanni on SeaLife Base: Technical fact sheet. Satoshi Takeda, Masatoshi Matsumasa, Hoi-Sen Yong, Minoru Murai. 15 June 1996. 'Igloo' construction by the ocypodid crab, Dotilla myctiroides (Milne-Edwards) (Crustacea; Brachyura): the role of an air chamber when burrowing in a saturated sandy substratum Journal of Experimental Marine Biology and Ecology Volume 198, Issue 2, Pages 237-247. Ng, Peter K. L. and Daniele Guinot and Peter J. F. Davie, 2008. Systema Brachyurorum: Part 1. 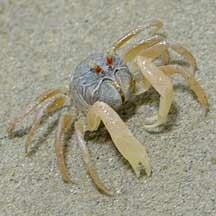 An annotated checklist of extant Brachyuran crabs of the world. The Raffles Bulletin of Zoology. Supplement No. 17, 31 Jan 2008. 286 pp. Lim, S., P. Ng, L. Tan, & W. Y. Chin, 1994. Rhythm of the Sea: The Life and Times of Labrador Beach. Division of Biology, School of Science, Nanyang Technological University & Department of Zoology, the National University of Singapore. 160 pp. Ng, P. K. L. & Y. C. Wee, 1994. The Singapore Red Data Book: Threatened Plants and Animals of Singapore. The Nature Society (Singapore), Singapore. 343 pp. FREE photos from wildsingapore tagged with Dotillidae. Make your own badge here.